The most common type of sea glass jewelry for sale is a sea glass pendant. It is the first type of sea glass jewelry that I created. It’s easy to see why this is usually the first type of jewelry crafters make. First reason is that the size of most pieces of sea glass is a perfect size to create a pendant, be it small, medium or large. It’s also the easiest piece for a beginner to create because it doesn’t require any drilling or special tools. A beautiful pendant can be created with a simple wire wrap. If you don’t know anything about wire wrapping, don’t fear! There are many tutorials online that show wire wrapping techniques. Some are simple, some are more complex. I picked one video and followed it step by step until I got it right. Once I got the “hang of it” I started looking at other wire wrapping videos and incorporating different techniques. I learned how to create decorative wire spirals and how to “kink” the wire to give different looks. 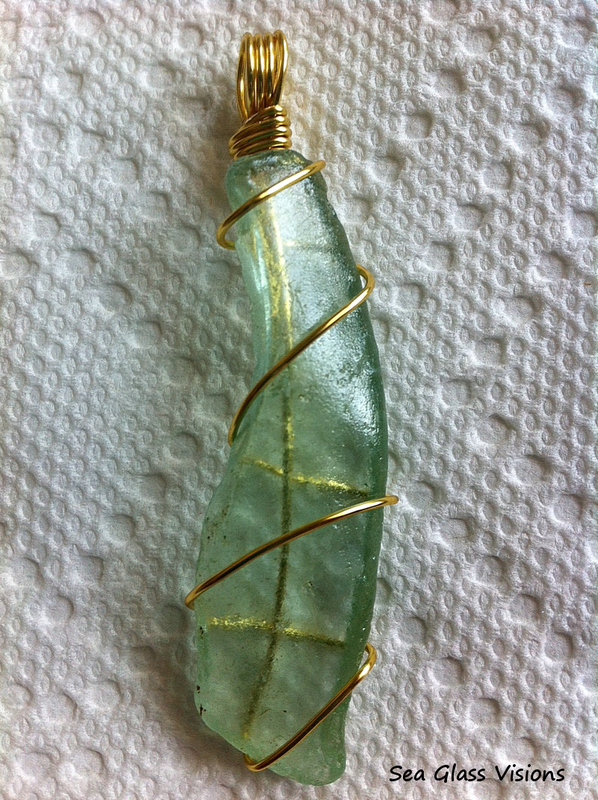 Now wrapping a sea glass pendant has become second nature to me. Sometimes I use one piece of wire, sometimes two. Sometimes I start at the bottom of a piece of glass working up to the bail and sometimes I create a bail and work down the piece of glass. Sometimes I use beading to add a bit of glitz, sometimes I don’t. When I knew I was serious about working with sea glass and creating sea glass pendants I made the decision to purchase a Dremel drill and drill press. This really opened up many options for me. What you will find, as I did, is that some pieces of sea glass need to be drilled in order to use them effectively. Your decision to drill a piece of sea glass may be made based on the size or shape of the glass. The option to drill also opens the door to new and interesting design ideas. Just last week I was asked by one of the shops I consign in to fix a piece a sea glass pendant a customer brought into them. It was a cute piece of jewelry with a lovely wire wrap. The piece of glass was half of a bottle bottom, the top was straight, the bottom was curved, so the shape is a half circle. The problem is that the wire was only wrapped around the piece vertically. The wire had loosened and slipped off to the side. If the person who created this piece had drilled a hole in the top of the glass to create an anchor for the bail the vertical wrap would have worked. Also, depending on how serious you become about creating sea glass pendants, you may find, as I have, that not all sea glass is created equally. Some is so beautiful you won’t want to use any wire at all. For me this is the case when I use sea glass such as English Multi’s. All this gorgeous sea glass needs is a very simple setting. 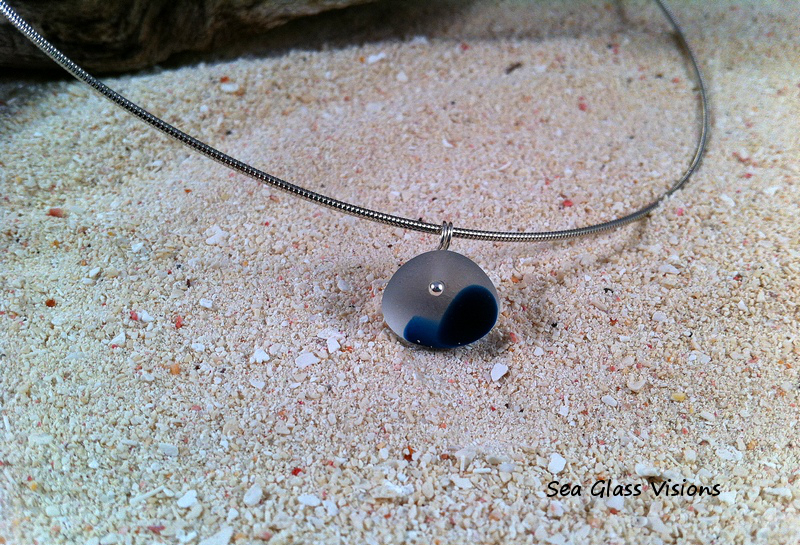 One way to set a sea glass pendant is with a silver bezel setting, which is a widely used technique. I don’t know how to do this, I hope to attend a silversmithing class soon. Until then, I employ a very simple drill and bail that doesn’t detract from the beauty of the sea glass. This piece of sea glass is a gorgeous English Multi or End of Day glass. In order to not detract from the glass I have used a simple drill and bail technique. No matter what type of sea glass jewelry I am creating, my intent is always to “honor” each piece. It’s all about the glass. This entry was posted in Sea Glass Pendants by Cathy. Bookmark the permalink.